Battle River Watershed Alliance and Northern BC Regional Case ECHO team members in Camrose, Alberta, on October 2nd, 2017. Welcome to our quarterly ECHO update: December edition! Our December update provides an overview of activities and insights gained by our regional case teams since September and how ECHO Network activities are shaping up across the Network, including with our collaborating teams at the international level. We hope you enjoy this newsletter and welcome suggestions for future updates! Since our September update, our core ECHO Network team progressed a variety of activities, ranging from the structures and processes needed for multi-institutional research ethics, to firming up our multi-site governance structure, conducting entrance interviews with a core group of ECHO Network team members and planning ahead for project-wide and specific research projects. We have laid the foundation for our ECHO Network Learning Community. In August,we circulated and collected the ECHO Network Global Consent form. This step was enabled through the approval of the research ethics protocol for Phase 1 of the research work plan for the ECHO Network, for which UNBC will be the overall Board of Record. If you have any questions about this please contact Diana Kutzner (diana.kutzner@unbc.ca). Welcoming core ECHO Network research staff: Dr. May Farrales, Dr. Vanessa Sloan Morgan, and Dr. Ben Brisbois have officially come on board as Post-doctoral Fellows eithersupported by or linked to the ECHO Network. Our current ECHO Network ‘core’ researchteam is 15 members strong. May is leading the arts-based narrative / creative experience theme of ECHO, supported by the Health Arts Research Centre (HARC; http:// healtharts.ca/) and ECHO; Vanessa is leading the entrance interviews as a foundational feature of our learning community; and Ben is advancing project outputs from the Health Im-pacts of Resource Extraction and Development (HIRED), linked to the network’s NorthernBC regional case. Designing an ECHO Network Learning and Impact Framework: We are committed toestablishing systems to track the learning and impact of the network, including inputs, outputs, research activities and agreed collective learning priorities relevant to the research objectives and outcomes of all components of our research. Tanis Hampe at Northern Health with assistance by Diana Kutzner, ECHO Research Manager, and the Team Learning and Impact, are leading the co-design of the overarching learning and impact framework for the ECHO Network, with input from across our team. New ECHO Network website –the new ECHO Network website is under active development! The new website ad- dress is www.echonetwork-reseauecho.ca and will be updated and populated with ECHO Network related news and ma- terials for launch early in 2018. If you have suggestions or capacity that could contribute to the website, please let us know! Our monthly ECHO Network Research Assistants meetings are coordinated by Shayna Dolan, Research Assistant and Project Assistant to ECHO. These meetings enable an information exchange for the RAs but also an opportunity for RAs to engage in ECHO related training, for instance with regards to establishing an online reference database through. Upcoming primary research activities include May Farrales’s Arts-based Narrative research project and our ECHO Network survey. Facilitating team collaboration across space and time, through the adoption of the Canadian-based digital platform known as Igloo, which we are currently customizing to our team’s needs. Igloo will become our collaborative online platform for core ECHO Network research team members in early 2018. Series of exchanges across regional cases –in early October the Northern BC regional case team members had an op- portunity to travel to the Battle River (see also BRWA update in this newsletter). In January 2018, Margot Parkes will be returning from her travel to ECHO Network partners in Australia and New Zealand. Exciting connections and po- tential exchanges of tools and processes with our international ECHO Network partners are already shaping up as a result of the travels. The ECHO Network Annual Meeting will be hosted by the University of Alberta and the Battle River Watershed Alliance in Camrose, Alberta. You should plan to arrive in Camrose on July 29th; the meeting is scheduled to end in the afternoon of Aug 1st. There may be opportunities for ECHO related team meetings on the following day(s); stay tuned for further details! Some ECHO Network team members are looking ahead to the 7th biennial conference of the International Association for Ecology and Health in Cali Columbia; see also http://ecohealth2018.co/. Abstracts deadline is at the end of December 2017. 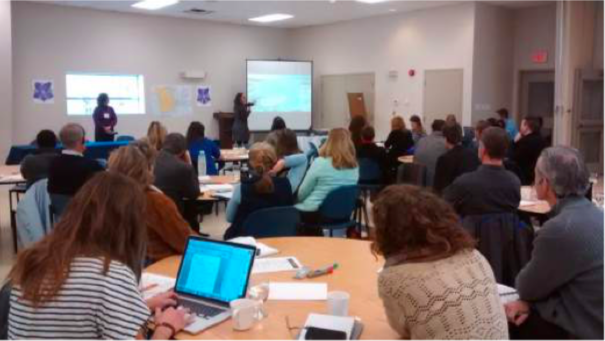 Upon her arrival to the team in September, New BrunswickEnvironmental Network’s new Research Coordinator, ArianeJuneau-Godin, dove right into the organization of the annual conference of the Children’s Environmental Health Collab-orative (CEHC), which was held on November 28th, 2017 in New Maryland, New Brunswick . The Conference was titled:“A Tale of Two Necessities: Children and Resources Development” and aimed to look into the impacts of resourcedevelopment on children’s health (see also here for an overviewof the event http://nben.ca/en/tale-of-two-necessities-children -and-resource-development). This year’s conference theme was chosen in part to integrate ECHO’s concepts within the CEHC. We were able to welcomeDr. Céline Surette, from the Université de Moncton, who gave an interactive workshop which led participants to reflect ontheir connection to their watershed, as well as Dr. Donald Cole from the University of Toronto’s Dalla Lana School of PublicHealth, who spoke about the importance of applying the precautionary principle when addressing issues relating to cumulative effects impacts of resource development on health. We also had the pleasure to hear from Marjorie McGibbon, RN and Paediatric Oncology Patient Navigator for one of New Brunswick’s two health authorities, on the topic of children’s vulnerabilityto environmental exposure and the importance of looking at children’s health from a global health perspective. The recentreorganization of the province of New-Brunswick’s Office of the Chief Medical Officer of Health has had a significant impacton the state of Public Health in the province, as well as on the work of the CEHC. Lastly, NBEN has recently created a new Environmental Rights Caucus comprised of environmental groups, which will be advocating for the passing of an Environmental Bill of Rights at the provincial Legislative Assembly. We hope the upcoming 2018 provincial election will be fertile ground to raise awareness towards this issue among candidates and MLAs. Finally, the research team has recently added a new member to its team—Anne Fauré, a Post-doctoral Fellow, has started to conduct sev- eral ECHO Network Entrance Interviews and began to compile a literary review geared on cumulative impacts. The Battle River Watershed Alliance has had an exciting fall, with many projects on the go! around the question of how we “power our way forward”, and touched on the complex ways in which economic, community, and ecological considerations inform how we approach energy options and opportunities in our watershed. We are currently developing a “how-to” guide to provide ECHO Network partners with insight into the process we undertook to plan and implement the bike tour. We were happy to host many members of the BC ECHO Team in Camrose on October 2nd. The morning included lively discussions about “state of the watershed” reporting and indicator development, experiential education connections. between AB and BC, and other ECHO-related work. In the afternoon, the team ventured out into the snowy weather for a mini-tour of the watershed. ECHO Network Research Assistant Dar Amsalu has been working to pull together information on the plethora of envi- ronment, community, and health data sets available in Alberta and across Canada, which will help inform our work of de- veloping a more robust watershed health indicator framework. Dar is also undertaking a literature review to investigate po- tential linkages between cancer and drinking water contamination in Canada and the US. This information will support fu- ture work with Alberta Health Services. ECHO team members meeting the Battle River on a snowy October morning: from left, Jo- seph Gothreau, Barry Booth, Dar Amsalu, Lars Hallstrom, photog- rapher. The BC Hub for the Local Environmental Observer (LEO) Network has hosted a few more great monthly webinars since our last update. The mostrecent webinar’s focus was on “LEO in the Classroom”. Tracey Murphy, asocial studies teacher with Saanich School District on Vancouver Island, shared her experience of introducing the LEO Network to her grade 10 class. Her class has just begun to dive into the LEO Network and the benefits of using this platform are already being identified. A few examples of these benefits are that the students are learning new skills, learning and engaging with the Elders in their communities and the LEO Network is providing a platform for teachers to integrate Indigenous Knowledge into their curriculum. It is very exciting to see how this work will progress over the school year! The webinar session was recorded so if you are keen to listen to the session please email Dionne Sanderson at Dionne.Sanderson@fnha.ca. Our regional case team had our first meeting in early October and we are hav- ing our second meeting in the middle of December. FNHA has been working on the development of an ecological indicator for health and the approval of overarching research ethics related to the ECHO Network project. Jordan Brubacher, Research Assistant working with our regional case, has been creat- ing great GIS visualizations (i.e. maps) exploring the anthropogenic exposures on the environment for potential use in environmental health research. 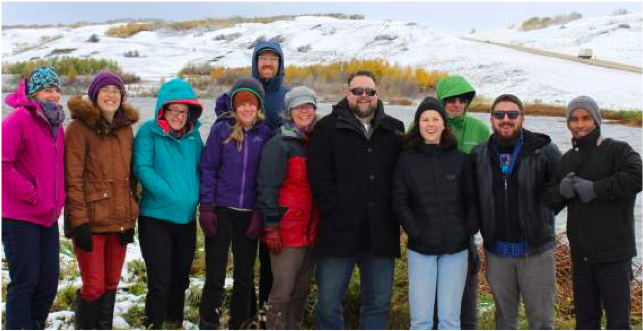 Throughout the fall, the UNBC Cumulative Impacts Research Consortium (CIRC) had the opportunity to facilitate a workshop session with members of the Nechako Watershed Roundtable Core Committee. This workshop focused on discussing land-use planning that promotes the long-term health of ecosystems and communities and, importantly, involves communities in planning and decision making processes. We also facilitated a community workshop in Fort Nelson, in which we presented a suite of publicly available information into a “regional profile” displaying socioeconomic, health and environmental indicators for the Northern Rockies Region. In addition to getting feedback on the usefulness of this tool, and the ways in which it complements ongoing processes in the Northern Rockies, workshop attendees shared stories in relation to the connections between environment, community, health and resource development. In September, members of the CIRC team attended and presented at the RAIL Commons conference in Olds, Alberta, before travelling on to tour the Battle River Watershed with members of the BRWA-ECHO contingent. CIRC, with the support of ECHO and the Pacific Institute for Climate Solutions (PICS), is in the process of planning a policy-oriented symposium in Prince George on January 18-19, 2018. This event will provide an opportunity to convene conversations with people and organizations interested in and actively working on issues related to the myriad impacts of resource development throughout northern BC. Northern Health and the First Nations Health Authority held a series of community engagement sessions in Fall 2015 exploring health and community impacts in relation to resource extraction and development, and recently released a report summarizing our findings (available at: http://www.fnha.ca/Documents/FNHA-Northern-First-Nations-Caucus-Overview-Fall-2015-Full- Report.pdf). The feedback from participants was overwhelmingly rich and insightful, and the report highlights a number of chal- lenges, opportunities and best practices that exist in this area. the Ngāti Hauā Mahi Trust. Applications for ECHO-related geospatial tools (a combination of the UNBC Watershed portal and LEO Network tools) to support Maori-led initiatives that response to cumulative impacts of hydro-electric development, forestry and intensification of agriculture, such as in the Waitaki Catchment. Plans to trial the geospatial portal tool with ECHO collaborators in NZ are pro- posed for early 2018. Maori-led wetland restoration and catchment management initiatives in response to cumulative land and water challenges that affect communities, environments and health. Site visits in Wai- kato and Northland regions demonstrated Indigenous-led examples of “taking notice for ac- tion” in ways that connect sectors and cultural priorities, and foster healthy livelihoods, livingsystems and lifestyles. Opportunities to connect across Canadian and Oceania regional cases will continue to be explored and profiled in future ECHO updates. Opportunities for international exchanges among early career researchers and learners is a clear priority, including planning in advance for these in relation to upcoming events and activities (see ECHO Preview, p.2).